There are a billion different ways to be a parent, and obviously, the hubs and I have developed our own way of doing things over the past 7.5 months (time flies doesn’t it!?) Many people don’t believe you can be minimalist and have a baby, especially if you have grandparents buying birthday gifts and Christmas gifts and just-because gifts, but we’re doing just that. In the post below, I’ll outline my thought process. Really, it’s just for the people who asked me how to avoid all of the excesses that kids usually come with and not for the people who love having tons of toys and fun things around! I should mention that I have friends who have homes that look like incredible toy stores, and my kids love having play dates and enjoying all of those fun things! It’s just that for me personally I’d rather keep my own home as minimalist as possible. So, here’s why we decided to try living this way with our kids and how we go about maintaining this lifestyle. Why Choose the Minimalist Lifestyle? 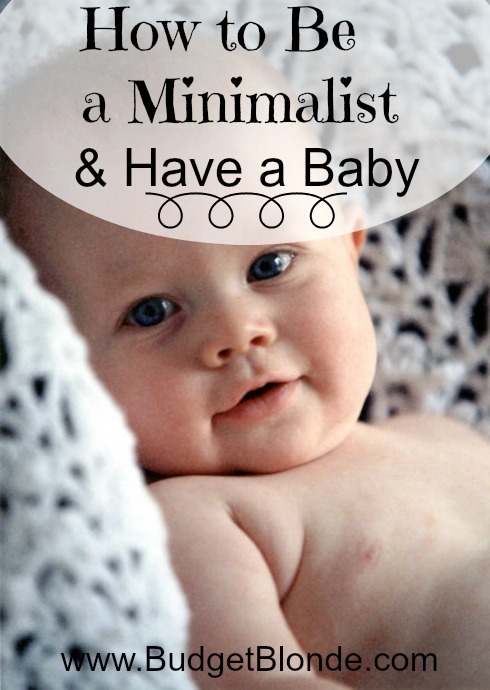 We decided that “minimalist” was a good one-word definition of our parenting philosophy when I was pregnant, but the roots of this decision go back to our three years living in the Caribbean. While we were living there in Grenada, we met a lot of the local kids, kids who had fun playing on the beach, kids who only got one gift for Christmas, kids who didn’t know about the whole Santa Clause thing, kids who didn’t live under the pressure of having to learn 5 languages and go to the best schools and have the right toys and God knows what else. So, we went into this whole parenting thing determined to buy very few baby gadgets, determined to not have a house overflowing with toys, and determined to just do the best we can to raise little humans who didn’t live in a house full of distractions. We just want our kids to play outside, read a ton, write, make up stories, and in general just have a silly, fun, active childhood like we did. The hubs grew up without video games, and I fully support that for our kids too. It’s obviously not for everyone. There are plenty of kids who love video games and tons of toys and are doing quite amazingly. My old boss, Sara, gave me great advice when I was still living in Grenada. I’m paraphrasing a bit but basically she said try not to buy something that will mimic the next step before they actually get to that step. that help babies sit up. Babies love these and parents love these, but we decided not to get them. The beans will soon be sitting on their own in their own time without them, and that’s fine by me. Sometimes I prop them up using two airline neck pillows that we already had, and it seems to do the same thing if they are squirming for a different perspective. We just recently bought the beans high chairs (you could also get booster seats to save money and room) and because of this recent purchase, we are now doing away with their bouncy chairs that they enjoyed for so long. Basically, as soon as they move to the next phase of something, I go ahead and get rid of what they’ve outgrown. Now, if you want more kids, this could mean putting it in the attic or the basement, but for us this means donating the items or selling them on Criagslist since we’re pretty sure we are done having kiddos. The goal is just to maintain a nice, minimalist home without 5,000 baby things strewn everywhere. I think the problem comes in because raising kids is freaking busy. So, it’s hard to put things away or store them when necessary because there is zero time during to day to even eat cereal let alone become Martha Stewart and organize everything. So usually in most households things just multiply as kids get older and soon you have a 3 year old and the Bumbo is still in their closet, ya know? I’m guilty of this myself. I have a twin breastfeeding pillow taking up room in their closet, and since I’m done breastfeeding, it’s time for that to be donated. Parents are always marveling about how their kids love the box better than the toy or they think it’s cute when kids play with tupperware or the empty wipe container. My thought is that if your kids like these random household items so much, then why keep buying them so many toys? I mean, my 7 month old daughter went to town grabbing the newspaper and throwing it all around the other day. It kept her busy for 45 minutes. She was elated. I’m so glad she had that and not some specially designed bright, blinky toy that guarantees she will certainly be smarter after using it. Don’t worry; I’m sure you can find some article about how the ink on the newspaper can permanently scar her or whatever parenting propaganda is flying around these days. I choose to ignore all that too, because being a minimalist parents also means just doing what works, what’s common-sense safe, and what feels right in your gut. We do have a lot of books, we used many different swaddles when they were smaller, and we use glass bottles every day. I had a nice breast pump that I then gave to my sister when I was finished using it. We bought under the bed monitors for safety. I just recently caved and bought one exersaucer off of craigslist after resisting it for weeks on end, but they seem to like it! In sum, it’s all really a matter of preference. I tend to say no to things that can’t be put away easily or things that seem really excessive or unnecessary. I try to use my history brain and think back to kids of older generations and what they likely had as babies to play with. I also think of those adorable kids in Grenada who didn’t have much but seemed to be happy. What are some of the things you didn’t buy for your own kids? Goodluck on the minimalist! I still believe mother knows what best for her baby. Just don’t forget to get a bottle warmer. I am sure you will need it more often. Yes we actually have a bottle warmer. I think if we had just one baby we wouldn’t have gotten one but with two, it helped to put one in the warmer and one in the sink under hot water. When they’re both screaming, it helps to move fast that way haha. I love this!! I had a friend back in AZ with three kids who had SO MUCH STUFF. My kids loved it, but there is no way I would be able to function in a house that crowded. She said it slowly added up – the kids get birthday gifts from all the relatives, Christmas gifts and random gifts and it just all adds up. I would be selling or donating the old stuff as the new stuff came in. We are also more on the “minimalist” side. In fact, come to think I’ve it, I think I’ve only purchased one toy since having kids. They have toys, but they’re from other people. We buy books, the girls color, they make up games to play, etc. Last night I gave my 14-month old an empty milk jug to play with and it kept her busy for a while. The best toys are trash, LOL! Thanks. Yep I bet it does slowly add up and then it’s like too much to go through and it’s overwhelming. I’m trying to think of a plan for next year to really cut down the clutter in general – like taking one drawer at a time type of thing as the year goes on. I had a swing which came in a lot of handy 🙂 But there were many things I didn’t have either. Oh my sister swears by her swing. She can’t believe I didn’t get one lol. Her babies slept in that thing constantly! And good to know about the pacifier. So funny how she picked it back up again. Kids are so interesting. I love that you shared all of the things you did not have for the twins and despite the fact you didn’t, they still have turned out well. 🙂 Overspending when Will was an infant is a big regret that I have as a parent. He had no idea nor did he care what he had and we could have saved hundreds of dollars for actual things that he needed or to help offset daycare once he started. It’s easy to get caught up in the hype of baby stuff, but it is a waste at the end of the day. Aw thanks. We’re pretty fond of the little beans. It’s definitely tough to resist esp when other kids have so much! We didn’t get a swing.,, until recently. Can’t figure out how to get the baby to nap in the crib, so it’s become a must. We don’t have a pack and play and only have a jogging stroller. We’ve probably forgone lots of things that I can’t even think about, too. My sister swears by her swing. She thinks I’m nuts for not having one lol. How do you handle others? My mother and in-laws INSIST on getting my kids way too much stuff. Then they get mad, when we purge things and sell or donate things they gave them. We are in a newer home in the south so it’s big enough for us to have a playroom. I don’t mind my kids having toys but of course it’s a battle getting them to clean up the entire room they took out for their games!! Last year we ask them get us family passes for the zoo and aquarium. We thought these would be good so we always have stuff to do. We also thought the expense would keep them from buying toys…but they got those too!! I think the pack n play will only work so long! They are little and probably don’t mind confinement at this point, but eventually they will not want to hang in there! We basically had just our living blocked in when they were small. The place we lived in only had the lr, a bathroom which had a knob lock and the kitchen. Mostly we feared the kitchen and the stairs going both up and down. We made the living room completely safe for them to play in even unsupervised. This gave them freedom to explores a sizable space but the safety I needed for peace of mind! Well we haven’t encountered Christmas or their 1st birthday yet so I’ll keep you posted but everyone is pretty aware of how we want things. The grandparents so far have purchased them mostly clothes esp as the weather has changed which was a need! I’m sure they will get toys for Christmas, and when that happens we’ll see which ones they like. I know my mother in law at least scores amazing deals, a penny here a penny there – so it’s not like they made a massive investment in toys and we just donated it. We’ve emphasized we’d rather put money in their investment accounts. I love you even more for this. Our girl is due in 10 weeks and we are striving to be minimalist with her stuff, too. I have several reasons – I have seen so many people have their house overflowing with kid stuff, only to have the kids barely glance at most of it. Second, when I was a baby my mom didn’t have any of this stuff we now have – bouncy seats, vibrating swings, exersaucers, etc – and she said she had no problem. Finally, I read a very interesting article that really spoke to me. I’ll link it below. What I’ve found most interesting as I’ve shared our philosophy and planned approach is the STRENGTH of conviction in others’ responses when they feel differently! Holy cow does parenting bring out strong opinions. People are SUPER annoying with their unsolicited parenting advice. No two kids are alike. Heck my twins aren’t even remotely alike so what works for one won’t work for another! If you find you need the swing or whatever then go and get one but to imply you have to have 40 things in your house ready to go is cray cray! Seriously. Grandparents love their beans lol! That’s how it was at my house. Plus my sister gave me all of her old stuff- her high chair, swing, car seat, etc. I hardly had to buy anything at all. YES to this. So thankful that we’ve been able to keep things to a minimum, and one of M’s favorite “toys” is my wisk 😉 We are storing everything she outgrows in my parents’ basement [since we aren’t “done” ;)] and it’s so great to keep the clutter down, and just rotate when the next thing comes. Really regret getting the bumbo afterall [we never used it for her to sit-train bc I’m like you in thinking that they need to reach it themselves] the only perk is that it DOES sub sometimes as her “highchair” while we wait for my parents to bring her real one…and then we’ll send the bumbo home…or just get rid of it?? Can’t decide…it might be a nice “baby doll chair” who knows. Thanks Amanda!! I actually just talked to my father in law about opening them a custodial account – similar to TFSA (I think the TFSA is a Canadian thing!) I prefer that over savings bonds since at least in the US savings bonds don’t have as good of a return. Great post, Cat. I try not to be swayed by all the propaganda but it certainly was difficult when registering for the baby. Now that she is 6 months old I can say that the Bumbo is silly. BUT as a wee little one, the swing was amazing and now she looooooooves the exersaucer (which was a hand-me-down). The things I could do without: sound machine, bumbo, video monitor, johnny jumper (also a hand-me-down) and plush rattles. When I was registering, my mom tried to keep me in check by explaining that “when I was a new mom we didn’t have all these fancy gadgets and we didn’t have any money…” To some extent, she was right. On the other hand… some of the new gadgets are kind of cool! As for simplicity, both my cousin and I were infinitely fascinated by an empty Clorox bottle and laundry pins. We’d drop them in one at a time, then dump them back out and start again. Kids are pretty easily amused in general. Don’t worry. When they get to be about 6, all they really want is money. As for the iPad at age 6, all of the popular kids have one (according to my granddaughter). Learn to say NO! Haha yeah gotta bring your boyfriend over to the awesome side. 😉 WE love the library. The babies go to mommy and me reading time and it’s so cute. I am often amazed by all of the crap that people have for their babies. Then, you look at countries where parents just have a sling and diapers and the kids are just fine. Basically, I think sometimes we over think parenting. Sometimes less is more. Such good advice about donating things when we’re done. I have TWO nursing pillows in their closet and stopped nursing 2 months ago! You’re inspiring me to call the local multiples club and donate this stuff! I think this is a great way to go about doing things! I don’t have any friends with babies, but it seems like they are the main source of clutter for a lot of families. There’s just no need for that many toys! If you can entertain your kids on less, then you might as well do it. I did grow up with video games, but there’s something to be said about how kids are becoming glued to the TV/computer these days. It’s like no one goes outside to play anymore! I’m so happy to read this! We’re still in the planning stages for kids, but people have already given us a ton of hand-me-downs (which I’ve gladly accepted since they’re free!). I’m terrified by the sheer amount of stuff people keep telling me a tiny baby needs and I’m kind of planning on not buying anything (other than diapers, etc) until after the baby is born. We’ll see how that pans out once I’m actually pregnant, but, I’m really happy to read that you’re maintaining minimalism and frugality with your beans! I think you might need to re-phrase that first part, having the opportunity to learn 5 languages and go to great schools is a privilege I guarantee that every parent in a developing/third world country, such as Grenada, would jump at the chance to have that kind of education available to their child. I agree with keeping toys to a minimum and encouraging a sense of gratitude in our children, but education and access to a world class education should never been seen as frivolous. They might and they might not. The Grenadians are very proud of their culture and their laid back way of life. Those who do want to educate their children in that way typically send them to Canada or move to Canada. We were/are pretty minimalist with our kids (a 5yo and toddler twins). Another thing that we did that helped was we bought as we needed them, not in anticipation of them. So yeah, there were some things that seemed like a luxury, but we bought them because at least we knew we’d need them at that moment (not to prevent/help/anticipate something that hasn’t even happened). We also don’t have a lot of toys. I don’t give my kids anything for Christmas usually because everyone else does anyway. We have low shelves in the living room that houses their toys, and we donate or sell frequently the ones they don’t like or outgrew. Because of the minimal toys we have, my eldest is a pro at making things. He much prefers making a pretend TV or phone than actually watching real TV (we don’t let him play with our phones). He has made so many things out of his art supplies and I praise him for that skill he has of creating his own entertainment and making his own toys! Amen. It’s so nice to see people stick to common sense stuff. I spent most of last Saturday at my friend’s place and her son, who is about the same age as the beans I think, was very happy to play with an empty margarine container. He was equally happy with that and one of his toys. He was also very entertained by the noise he could make hitting the cloth shopping bag against the packages inside. Kudos to you! Sounds like you’re doing a great job! Great post ? I tried to keep things to a minimum with our first baby and when possible bought second hand. With no2 I got rid of some stuff as it just took up too much room. The bumbo was a life saver though – he was a windy baby and much more comfortable sitting upright before he was able to do it himself. However keeping things at bay is starting to be a battle now that my eldest is nearly four and knows what she wants! And three+ years of Christmases and birthdays have added to our ‘stuff tally’. My two don’t have a lot of clothes but we often get given hand-me-downs – which I love! – but it does mean we have clothes sitting around waiting to be grown into, which is a bit of a pain. My husband and I only plan to have the kiddo on the way and I’ve had hand me downs coming in like crazy! I’m borrowing stuff from one sister and plan to pass other stuff to the other sister if she is having a girl too! I only asked for what I felt we need and some means duplicates like 2 car seats for both infant and older, 2 jogging strollers, and 2 pack and plays but we also live in a tiny 1bd room on the 4th floor and only one car can carry baby but the extra seats can be taken along for grandparents to use without us uninstalling and re-installing ours all the time. One stroller stays in my car and the other upstairs in the closet so if my car is gone we can still go for a run 🙂 pack and play is the same deal as car seats one for grandparents houses and stays in trunk and one for home but it’s doubling as a bassinet and crib too cause we don’t have much space. We are expecting our first in July and this was so refreshing to read! It’s nice to see that I’m not alone in striving for a more minimalist lifestyle. One of my favorite games as a child was putting my dolls down to “Nap” using napkins as blankets. Anything can be a toy with a little imagination. For those of you struggling with receiving toys as gifts; you can always ask for or give experiences. I have much younger brothers and their birthday gift from me is always a special day out. They get to pick one paid activity (mini-golf, laser tag, skiing, concert) unlimited free activities, and a meal out. The boys look forward to it every year and those memories will last a lifetime. Good post. It’s good to see other mothers trying to keep parenting simple. My husband and I, before my son was born last year, decided that all the toys had to fit into a storage ottoman, except bigger items like blocks.. We joined the toy library which is great! We can borrow big items and then return them. It’s also great because we can borrow toys which he will only play with for a short time. In saying all this, his favourite toy is a wooden spoon and a cup. We did use a bumbo but only really for eating. We went on holidays when he was 6 months old and we put the bumbo on the chair and attached the tray so he could eat off it. When we were home we had him on the table so he could get as messy as he wanted and it was an easy clean up. It’s fun trying to be minimalist with a baby. I enjoy thinking outside of the box, saving money and being able to clean up easily. Reading that you lived in Grenada made me so excited. My mom is from Grenada. She was born and raised there. My older brothers were born there too. Growing up I went there a lot because my mom was working with the government to help clean up the island after hurricane Ivan. My first trip to Grenada was in 2006. I love it there. I hope to go back soon because I haven’t been there since April of 2013. That’s so cool. I can’t wait to take my kids back someday!